On the 29th of November 2016, in the Weekly part of our Nikkei 225 analysis section, we presented an analysis that suggested the ongoing uptrend would end in March 2017. As it turned out, that’s what happened, a double top occured in early March, followed by a considerable decline. On the 31st of January 2017, we suggested the market would move either sideways or up, and on the 28th of February 2017, further clarity had been restored, and we expected the Nikkei 225 to move through the 19615 level, which it did almost immediately afterwards. More importantly, on that same 28th of February analysis update, we suggested that after Nikkei 225 had reached 19615, risk would increase considerably and that taking negative positions (i.e. shorting) the Nikkei 225 would be a better value proposition. That turned out to be great advice, because the Nikkei 225 created a double top around 19650~ and then started a 1-month long correction which ultimately dropped approximately -7.3% from the double top highs. On the 4th of April, we noted that some indicators were turning oversold, and suggested that the bottom was probably not too far away, and that this decline would be followed by a rise towards the 20 000 level. This was not an exact bottom call, and not worded as such either, but the “rise towards the 20 000 level” part nonetheless came true later on in early June. 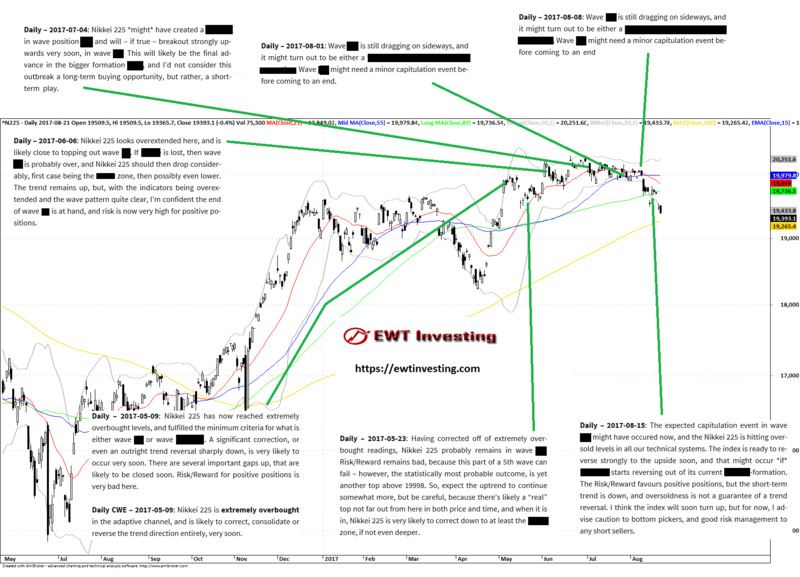 On the weekly update written on the 18th of April, we pointed out that the Nikkei 225 was deeply oversold, and that while the technical picture in terms of trend direction had worsened, we nonetheless expected a significant bounce or outright trend reversal, which is exactly what occured. On the 5th of May 2017, we warned that Nikkei 225 was extremely overbought and needed a break. Shortly thereafter, a decent correction followed, covering the recentmost gap. On the 23rd of May, we called for 19998 to be breached with a small margin, which is what happened approximately 10 days later. 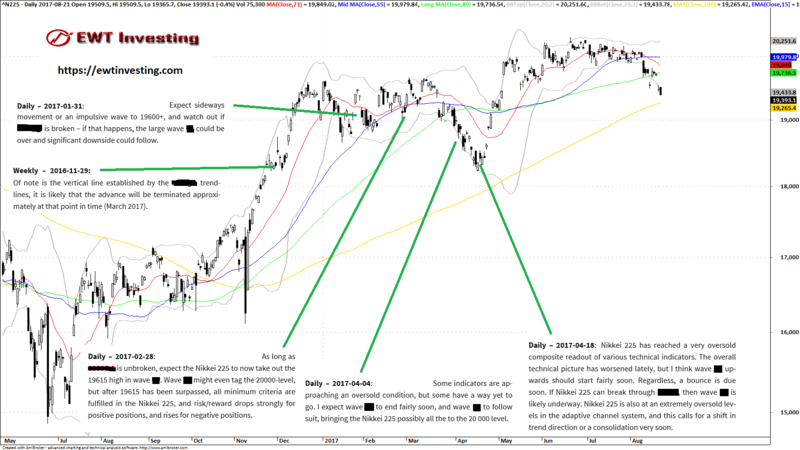 On the 6th of June, we warned that the Nikkei 225 had likely topped out, and could be about to decline strongly. This turned out to be partially incorrect, because a slightly higher high was made later in June, and the subsequent decline is – at least not yet – a particularly brutal decline. On the 4th of July, our assessment of Nikkei 225 changed slightly in the short term, and we expected a triangle was developing, with a breakout upwards to come. However, by the 1st of August the pattern had deteriorated from a triangle to something else (still unknown at the time of this writing…) and we warned that a minor capitulation event would be needed. This warning was repeated verbatim on the analysis update of the 8th of August. And indeed, the Nikkei 225 then fell out of the consolidation, causing losses for all who assumed for too long that it was a standard triangle. On the 15th of August, in time for last week’s update, Nikkei 225 had turned oversold, and was and probably is, in our estimate, setting up for a considerable reversal upwards. But considerable short-term unpredictability is now present in the daily chart. And at the time of this writing, the Nikkei 225 is not yet showing any clear signs of having found proper support to end this capitulation move, which creates a treacherous situation for those wishing to take positive positions in the Nikkei 225 (i.e. buying a downtrend), while the oversold conditions make taking new negative positions or maintaining old ones, quite risky as well. We got most things right with our Elliott Wave analysis of the Nikkei 225 index between late-November 2016 and up to mid-August 2017. It remains to be seen if our analysis stays more or less on target through the rest of the year. Access to the Nikkei 225 Extended Elliott Wave Theory analysis section is included in our Global Elliott Wave Coverage subscription service, and is currently updated 1x week.